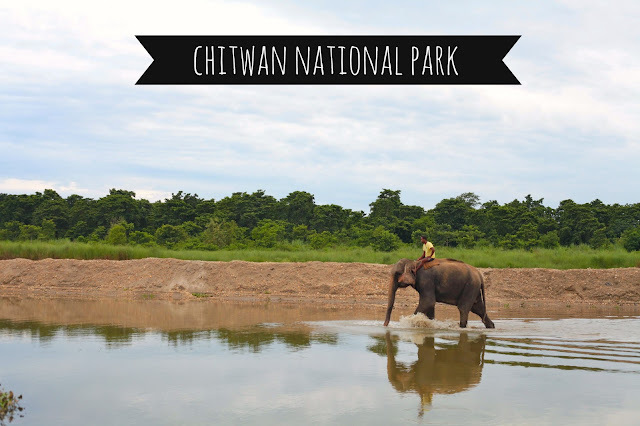 so our trip to Chitwan national park was really delightful. That place is gorgeous. to begin, we had to catch a bus in Thamel at 6:30am in the morning. When we woke up that day, it was not only torrentially downpouring (hmm..I spot a trend in our weekend) but there was also a Bandah happening. Now if you don't know what a bandah is, well, lucky you. It's a ridiculous thing that happens here in Nepal where some group decides to protest about something, and the military acts like it's WWIII and sends like, oh...I don't know, THEIR WHOLE NATIONAL SECURITY out to pulverize the puny little protest. so on bandah days, the city shuts down and no one goes outside. fittingly, there is a slogan in KTM that says "bandah ruined my life"
and the driver is like "finished"
and we're like "uhhhh we're not in Thamel"
we took that as our cue to exit. so we've got like 10 minutes to catch our bus, we're a 20 minute run from thamel, and you guessed it, it's still raining like a cat on a hot tin roof. talk about a hot mess...we're literally sprinting through the streets of KTM, splashing through puddles (which i'm sure consisted of about 100% germs, a fact that ran circles in my mind), and by the time we found a bus going to chitwan, you might as well have thought I had just got baptized by the entire pacific ocean. and there is a women banching wailing the whole trip. A serious hindu praise and worship sesh right there. and it just kept getting better and better. and by better I mean we found a massive ant hill in the bathroom, a tarantula on our wall, and a toilet that leaked water on your leg if you got anywhere near it. immediately I ran over to our friends bungalow to see if theirs was any better. the minute I walked in a giant caterpillar was crawling across their pillow. the next morning, the fun continued. We went out onto the crocodile infested river in a canoe. it was pouring rain. our guide stopped the canoe and the four of us got out onto land to do a "safari walk". at any moment we could have seen an elephant, tiger, rhino. "if it's a rhino, drop your things and run"
"if it's a tiger, they can outrun you and climb trees so just look them in the eye"
"if it's an elephant, they can outrun you and knock down trees, so pray to your God"
like seriously, look a freaking jungle cat in the eye and pray? ummm...are you sure there's no plan B? and to top it off, our poor guide was a sweet guy, but he was holding a stick. as if that was going to ward off a herd of wild elephants. after hiding behind a bush for 25 minutes in the crazy rain, we started our trek through the swamp. as a souvenir, kevin picked up a leech on his foot. rain dumped on our "elephant" safari and poor kev had to sit with a stick in his crotch, which...anyway, you get the point. we were with our best friends, in a wild animal park, and it was absolutely stunning. God is creative, and we had so much fun enjoying his creation in Chitwan. if you are in Nepal, this is a MUST do! That sounds like one CRAZY adventure, girl! But the pictures certainly look amazing!!! Wow, so many adventures! And some scary moments that I for sure would have freaked out over. This looks amazing!! I'm so happy I found your blog, you are an inspiration!! haha, the hand holding thing must be an asian thing. They totally do that in cambodia. One time my school director gave my husband a tour of the school and held his hand for like 15 minutes. What an amazing adventure. I just love the attitude you have. Crazy things like that can happen that could have ruined the trip for some, but you guys were still able to have a blast. Wow, girl, what an adventure!!! As crazy as it was, it will definitely be a trip you'll never forget. :-) Sometimes those are the best memories. Wow, sounds like your trip was quite a doozy! But glad that you still have such fabulous memories out of it! And the elephants? Wow! AWESOME PICS. I bet that was fun. I LOVE the picture of you pointing to the elephant. Yay!! And I can't believe the directions they gave you about the wild animals. Oh my goodness! PS I would not have had the rest of the weekend to enjoy after seeing the spider because there would only have been a little puddle of me left.....MAJOR spider phobia!!!! Those are such terrifying directions! "Look a tiger in the eye"... "pray if an elephant starts charging"... my gracious! I'm glad you guys were okay, though. And it really looks like such an incredible experience! Oh, and finally, the whole guys holding hands thing... very normal in China as well. And for girls, too. There it's as common as a boyfriend and girlfriend holding hands in the States. Different cultures certainly handle things very differently! Kudos to Kev and Patrick for working on being culturally sensitive! i loled at the man holding hands pic and the water bottle grab. oooh i miss you so! i loled at the random man holding hands pic and the water bottle grab. oooh how i miss thee! I love your face in the elephant picture!! Girls walking around holding hands is very common in Malaysia, so I always held hands when shopping with my friends over there, and growing up, we always noticed Nepali men walking around holding hands, too. That's very different from either American or Malaysian culture! Man, you guys are tough. That looks so cool, but you had a rough time getting there!